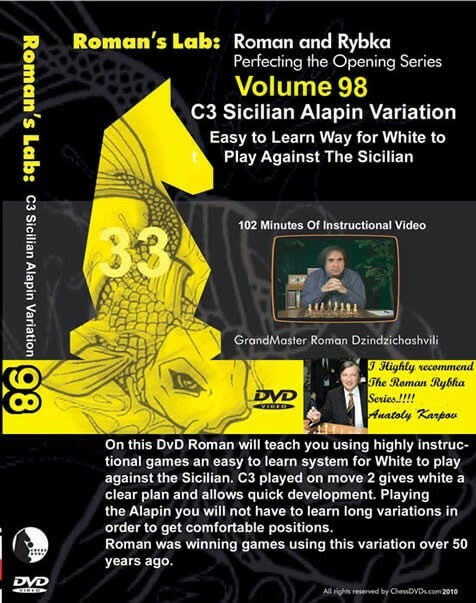 On this DVD, Grandmaster Roman Dzinzichashvili will teach you a powerful, easy-to-learn system for White to play against the Sicilian Defense. With the move 2. c3, known as the Alapin Variation, White has a very clear plan and positions himself for rapid piece development. With the Alapin Variation , you will not have to learn long variations in order to get comfortable positions. Roman has been using the Alapin Variation of the Sicilian Defense for over 50 years and is considered one of the world's foremost authorities on this under-appreciated system.